The Abu Ambassadeur UC6500C baitcasting reel. Browsing through a Cromb and Merrit Sports catalogue for the 1984/85 season one of the things that caught my eye was the price back then for Abu 6500C free-spool baitcasting reels. The price for these in 1984 was $320:00 This same reel today can be purchased from some tackle stores in New Zealand for $203.00. It is not often the prices of things go down. But when you take into account inflation fishing tackle has never been cheaper to buy that it is today. The Abu 6500c at just $203:00 is an absolute give-away. Perhaps this is the main reason why almost all salmon anglers nowadays fish with free-spool reels. The Abu 6500C continues to be one of the most popular salmon reels sold in New Zealand. Like many anglers purchasing their first free-spool salmon reel, it is possible to have big problems when learning to cast with it. Some anglers give up and switch back to an eggbeater. Most salmon anglers prefer baitcasting (free-spool) fishing reels. 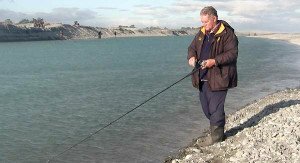 The author Allan Burgess salmon fishing at the mouth of the Rakaia River. The first rule when learning to cast with a free-spool reel is to set the spool’s mechanical brake adjustment knob correctly. To do this fasten the reel to your rod and thread the line up through the guides. Be careful to ensure that you don’t catch your line under and loose coils on the spool as you do so. Get into the habit of keeping the line tight on the spool at all times. Also be sure not to skip any of the line guides on your rod when passing the line through – even experienced anglers do this from time to time. 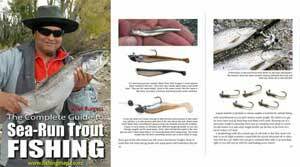 Only after a few casts do you realise you have missed out a guide? Next, tie on a Zed spinner. Holding the rod tip pointing out in front of you; do up the mechanical brake knob until it is tight with the Zed spinner hanging down about a foot from your rod tip. The idea now is to loosen the brake off so that the Zed spinner holds in that position a foot from the rod tip, but will continue to fall toward the ground if you tap the rod. This is where many beginners make the mistake of having the brake backed off too far in order to get more distance. Now put your thumb on the spool, use your other hand to press the spool release button to set the reel into free-spool. Most reels are designed for one-handed operation. This old style Abu reel is not. This where the more modern Shimano bait casters have an advantage because you can use the tip of your thumb to “lock” the spool then lower the heel of your thumb on the same hand to press down the spool release button! This makes one-handed operation a breeze. Cast the Zed spinner out releasing your thumb from the spool as you bring the rod tip over. Let your Zed spinner come to a stop on its own. Keep your thumb out of the way. Don’t be tempted to thumb the spool to stop it from spinning. If you have set the brake knob correctly it will stop taking off line on its own. Later as you become more experienced you can back the brake off still further. Many experts rely on stopping the spool as the Zed spinner reaches the end of its travel by placing their thumb on the spool. 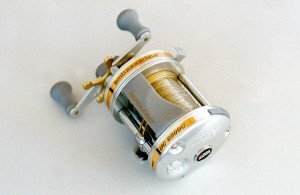 For beginners, this is a no-no, it is better to have the brake “too” tight and cast a bit shorter for a while until you get the “feel” of the reel. The Abu Garcia 6500C baitcaster is an excellent quality value-for-money salmon reel. Perhaps most importantly this old Abu 6500 is easily serviced, and spare parts are easy to come by. 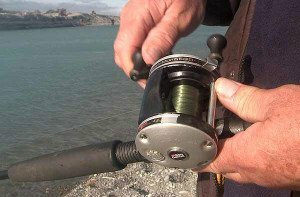 Some of the Abu range of free-spool casting reels have a calibrated ring around the knob and a small pointer arrow on the knob itself; usually from one to ten. The secret for beginners is to fish all day with the pointer in one place before backing it off. Almost all problems associated with birds nests are a direct result of incorrect adjustment of the mechanical brake. It makes more sense to cast a bit shorter until you get used to using your free-spool reel. Don’t worry about distance, that will come later! When salmon fishing in the river you don’t need to cast very far to catch a salmon anyway. This is a far better way of going about learning to use a free-spool reel than experiencing the frustration of constantly getting horrid birds-nests. If you have purchased a free-spool reel and are still having trouble casting without getting birds-nests, and are still unsure what to do, ask a bloke in the shop to explain it to you. Most good tackle stores will be only too happy to help. Another trap when starting out with baitcasting reels, such as the Abu 6500C, is to spool your reel with line that is too small in diameter. Strange as it may sound this size free-spool reel when used for salmon fishing will cast further and be less prone to casting problems if used with monofilament between .40mm and .46mm in diameter. Lighter lines will be inclined to stretch at the start of the cast and can lead to constant birds-nests. Fine diameter lines are the way to go when casting with a fixed-spool reel (eggbeater) as you will be able to cast further. On salmon reels like the Abu Ambassaduer 6500C focus on the line thickness rather than the breaking strain. Choose lines in the thickness range mentioned above. Check out all the latest Abu Garcia reels.